When we started jumping Dustry my instructor Amanda Brewer said to me ‘we are going to have to build him Chloe, piece him together bit by bit’ and that really stuck with me. Unlike any unspoilt-un-raced-bred-for-the-job-horse Dustry has had to overcome a lot of physical and mental hang ups. Through his training my instructor and I are gradually irradiating the traces of his past career and way of going, and piecing together a more desirable picture. He has come such a long way, and the biggest change has been with his jumping. Where you could trot a lovely green, clean sheet of a youngster to a fence and it would naturally work out how to jump round and through, you could not do the same with Dustry. 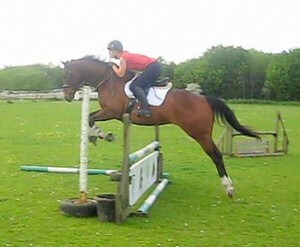 When we first started jumping he was hollow, and leapt in an unnatural and uncomfortable style. Months of careful training have revolutionised his jumping and now he feels like he has a really good pop! 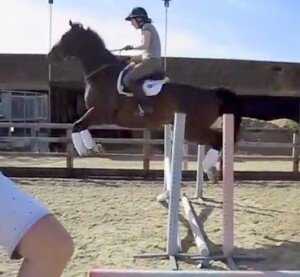 Just to show you the change this is a still from one of his first ever jump lessons…it wasn’t pretty!!! (left) and today practicing in the field tonight at home (right). Mr Lover Man – colty naughtiness is not acceptable!